I really struggled to try to find a logo or image that represented who I am and what I do. I’d tried several different artists and polled some other ministers. Nothing worked. And then God said, “Look at the peach tree in your front yard.” So I did. Then I remembered how, in my Temperament Therapy training, we were taught that God implants in every person a unique and specific temperament that matches God’s call and purpose for their life. It determines what specific strengths, weaknesses and needs the person will have. It is like a seed that has all of the DNA of what kind of plant that seed will grow to be, determining how much sunlight and water is needed and what type of climate will suit it best. But neither plants nor people live in a vacuum. We do not live in the Garden of Eden where everything was perfect. Instead, we live in a fallen world where living organisms aren’t always born completely healthy due to reasons such as genetic mutations. In addition, people have free will and their choices have an effect on other people as well as the environment. So you can plant a seed, let’s say a peach tree seed, and depending on its environment, genetic differences and how others may affect it, it may not look or act like we expect. Perhaps there was a drought, or possibly a flood. Maybe there was a hail storm or tornado that ripped through its neighborhood during a formative stage and marred its appearance. Maybe a large animal ran into it or tried to reach some of its fruit and broke a limb. Or maybe it was planted among other plants that choked out the sunlight or whose roots and presence didn’t allow it to grow to its full height in normal fashion. Or maybe someone cruel just decided to vandalize and destroy it. Something like this must have happened to the peach tree in my front yard. I don’t remember how it got there, if it was there before I married my husband and moved into the house, or if he planted it later. 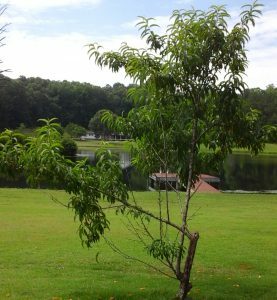 One day Ronnie mentioned something about the squirrels eating the peaches off of the tree, and I was amazed to discover we even had a peach tree. You see, I had never seen it bear fruit, no matter how many times I had seen it, so I had no clue what type of tree it was. The tree is misshapen, so something obviously must have happened to it. It has never grown more than you see, and some of the branches are completely barren. When it does bear fruit, insects get into the peaches. Squirrels run up the tree and steal them, and sometimes deer come into the yard for a treat. But no matter what it looks like, it IS a peach tree, just as God designed. Most of us are like this peach tree. God created us specifically for His purposes according to His design for us and how we fit into His Kingdom. But things happened in our lives that broke off a branch, or starved us from water or sunlight, or people were continually taking whatever we produced and leaving us barren, or in worst cases, tried to destroy us. Many of us had to figure out how to cope with our environment, including the people within it, and became who we thought we needed to be in order to take care of ourselves. However, that is not who God created us to be. And there is not a one-size-fits-all answer to this problem, because you are hardwired to be exactly as God created you, not like your mother or father or significant others said you should be. You have specific tendencies, and more importantly, specific needs that MUST be met. UNMET NEEDS CAUSE STRESS and leave us EXHAUSTED emotionally, physically, mentally and spiritually. What would meet the needs of your spouse or children may not work for you, because you are all uniquely fashioned and formed. In order to be healed and have your needs met, you need to learn how He made you and what your needs are, what we call your God-given “Temperament”. if not, find godly and balanced ways to meet those needs. This profile has a proven accuracy rate of 95.7%. The Temperament Therapy model is 93% successful for people who complete the Analysis and are serious about their healing, surrender who they thought they were supposed to be, and become willing to meet their temperament needs in a godly way. However, there is a second facet to my ministry called Life Patterns. When a storm ripped through your life, you had to make sense of your world and find new ways to cope with how that storm made you feel. Storms can come through unexpected life events, like death or divorce or sickness. Sometimes they come because of other people’s bad decisions and choices, and sometimes because of your own. You actually set up a Life Pattern at that point, and since it worked once, you continue to use that attitude and coping mechanism even today. However, it is most likely now hurting you, not helping you, and you don’t know how to stop doing it. 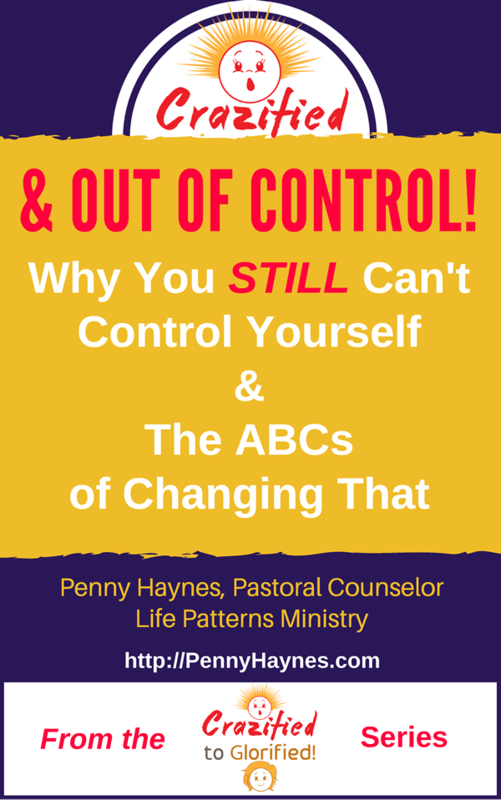 I can help you find the root of the Life Pattern and help you resolve it so you can develop healthier and more appropriate methods of dealing with life as a mature, godly adult. So if you are ready to find the solution to why you are always so stressed, why you overreact in certain situations or around certain people, and how to discontinue repetitive harmful thoughts and actions, then I invite you to check out my web site and learn about yourself. If you want to counsel with me regarding your Temperament or your Life Patterns, contact me. Find out how God created you to be, what He has called you to do, and get rid of all that is hindering you from fulfilling God’s purpose for your life.